Knowledge Representation: A metadata schema, as well as the actual descriptions of media items that may use the schema, need to be presented in some logical, clearly expressed framework so that the information can be understood, either in a human-readable form or machine or computer-readable. Interchange Structure: More importantly, using well-formed methods and frameworks to express metadata schemas and descriptions allows different parties to share data; they are communicating using the same language, the same grammar, and the same structuring of data. DTDs have been around longer than XML Schemas, and are very widely used. However, they have some limitations in their capacities, such as using non-XML syntax to compose a DTD, support for limited data types, inability to identify namespaces (see What is a Namespace? ), and no support for extensibility or inheritance. XML Schemas, however, do not have these limitations, and also allow users to craft their own data types. Typically, more complex data structures, with multiple data types, require the use of an XML Schema over that of a DTD. PBCore is offering an XML Schema Definition (XSD) document to define the framework of the PBCore elements and their inter-relationships and interdependencies (see the download links below). For further discussion in element hierarchies and interdependencies, see our web page Information about Hierarchical Relationships & Interdependencies Between Metadata Elements. 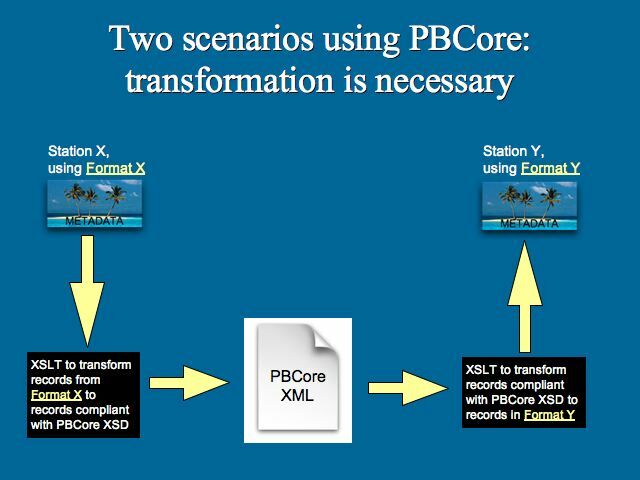 When sharing metadata and facilitating interoperability, data that is exported from an information system (one metadata island) is transformed into a PBCore compliant XML document, using the framework of the PBCore XSD. The receiving information system (another metadata island) imports the PBCore compliant XML document and transforms that data to match its own internal structures and metadata schemas. The following discussion highlights two different scenarios in which data is being exchanged between information systems. Station A uses an In-House tool to create and save descriptive records for its media assets. This tool can export the records as XML compliant with the PBCore XSD. Station B uses the PBCore Project's Cataloging Tool to create and save descriptive records of its media assets. This tool can import and export metadata records as XML compliant with the PBCore XSD. Station X purchased a tool (System X) to create and save descriptive records for its media assets. This tool cannot export the records as XML (in Format X) that are compliant with the PBCore XSD. Station Y purchased a different tool (System Y) to create and save descriptive records of its media assets. This tool cannot import or export the records as XML (in Format Y) that are compliant with either the PBCore XSD or Format X. Because the respective stations use tools that utilize records in different formats, they cannot exchange records without first transforming them into a new format that can be understood by both tools. The PBCore XSD can be used to move data between the two incompatible systems. Station X uses a transformation method (such as XSLT--Extensible Stylesheet Language Transformations; W3C or Wikipedia definition) to translate records from Format X into PBCore XSD-compliant data. Station Y transforms the PBCore XSD-compliant data into Format Y before importing the records into System Y. Within an individual Public Broadcasting station, there are many departments, each maintaining their own data islands that facilitate their individual departmental functions and missions. PBCore compliant XML documents could act as the data transformation framework that allows the different systems to share data. Here is an example of a typical Public Broadcasting TV station's metadata islands. The XSD (XML Schema Definition) for the PBCore metadata dictionary is available for download. 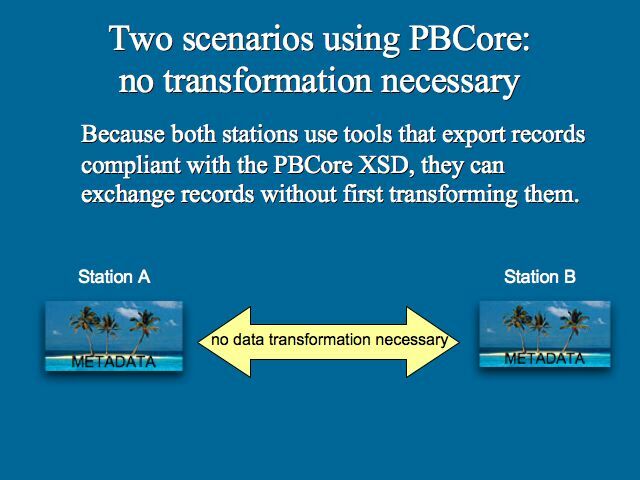 When migrating metadata from one information system (metadata island) to another system (metadata island), the PBCore XSD defines the structure and organization of the data exported from the source system. The PBCore XSD assists the information system that is importing the data by providing the consistent structure needed to re-transform the data to match that of receiving system. As of February 2009, PBCore is publishing the next iteration of its XSD, version 1.2.1. Its predecesor, version 1.1 was made available in October of 2007. Both versions of the XSD documents are offered below. A brief explanation of the changes in PBCore v1.2.1 XSD is found in the section below under the header "PBCore Diagram--At-a-Glance." in order to see the proper XML format. The hierarchical branches, and leaves of the PBCore framework are alternatively expressed in our data model as "Master Container," "Content Classes,' "Containers," "Sub-Containers," "Elements," and "Sub-Elements." PBCore v1.1 has 53 elements, organized into 15 containers and 3 sub-containers, all grouped under 4 high level content classes. PBCore v1.2.1 has 61 elements, organized into 15 containers and 4 sub-containers, all grouped under 4 high level content classes. The Master Container assembles together all collections of PBCore knowledge items. For PBCore these knowledge items are metadata descriptions of media. The MasterContainer is expressed as a document that hierarchically structures all the knowledge items and metadata terms and values related to a single data record associated with a media item. In our XML Schema Definition, the MasterContainer is referred to as the "PBCoreDescriptionDocument." Metadata elements describing the actual intellectual content of a media asset or resource. Metadata elements related to the creation, creators, usage, permissions, constraints, and use obligations associated with a media asset or resource. Metadata elements that identify the nature of the media asset as it exists in some form or format in the physical world or digitally. Additional descriptions that have been crafted by organizations outside of the PBCore Project. These extensions fulfill the metadata requirements for these outside groups as they identify and describe their own types of media with specialized, custom terminologies unique to their needs and community requirements. Elements are objects in the PBCore schema hierarchy that define a metadata field and its values, attributes and properties. An element may be standalone. If several metadata fields are thematically related to each other, they can be bound together under an Element Container. Related elements are subsumed by a larger theme, and should be bound together when data is shared (particularly if an Element Container is a repeatable description with multiple instances of its related Elements). Examples of related Elements bound within a Container are *title* and its associated *titleType*, that are bound together by the Element Container *PBCoreTitle*. Within hierarchical structures, a Container may house Sub-Containers, which themselves bind together related Elements. In PBCore, there are Sub-Containers found within the Content Class PBCoreInstantiation. Elements are objects that define a metadata field and its values, semantics, attributes, and properties (for a list of the attributes defined for PBCore elements, see our web page PBCore Element Attributes). An Element is the actual "thing" that carries the descriptive metadata about a media item, such as a title, a date, keywords, rights information, mime types, media types, etc. The metadata elements are what a cataloger interacts with (creating descriptions) within a cataloging tool or asset management system. Accommodating Content Classes, Containers, and Elements, the PBCore begins to look like the diagrams below. The justification for changes to the PBCore schema from v1.1 to 1.2.1 is to better accommodate the possibility that a media asset may have multiple instantiations, all the same except for their technical attributes. Thus, metadata elements that describe the media asset as a whole still exist in v1.2.1; however, the different attributes associated with multiple instantiations are now "containerized" under a new container called the pbcoreEssenceTrack. The recommendation for change in PBCore v1.2.1 is precipitated by difficulties in describing technical details about a media item. Specifically, and as an example, a single digital instance or rendition of a media item may have a video track, an audio track in English, an audio track in Spanish, and a captioned text track. Each track has its own unique technical specification, e.g., the video track has its own data rate, as do the audio tracks. The audio tracks also have sampling rates that are unique to digital audio, but unimportant to video tracks. Ideally, each track of a media item can have its technical details captured by its own sub-container with its own relevant metadata elements. Thus, the creation of the sub-container pbcoreEssenceTrack within the larger parent container, pbcoreInstantiation. A preliminary examination shows that some metadata elements are relevant for the media item essence as a whole, with all of its combined essence tracks. Other metadata elements are strictly relevant to a specific essence track. And yet others, such as data rate (and a gaggle of others), could be argued that they exist BOTH for the essence as a whole AND for specific essence tracks. Thus, metadata elements with similar meaning but differentiated by their ownership within a container or sub-container must be accommodated. These technical bits get rather complex and hierarchical in nature in order to represent them all in a meaningful way. Indeed, pictures (in this case diagrams) are worth several hundred words. Below, click on the thumbnails for versions 1.1 and 1.2.1 to view PDF documents illustrating the differences in structure. When the actual PBCore elements are integrated into a database and its associated cataloging application or digital asset management system, the "presentation" of the elements to the cataloger who is providing and entering metadata descriptions may not necessarily look exactly like the Hierarchy Diagram for PBCore. Often, the features and capabilities of a particular information management system require metadata elements to be displayed or function in specific ways. The actual "application" of the PBCore metadata elements may vary from the strict framework of the hierarchy or data model. However, if metadata is to be shared, it is vital that the system's metadata is exported according to the framework of the PBCore XML Schema Definition. This export may require some transactions or transformations to be conducted on the existing metadata. But when accomplished, the exported metadata becomes a "known" and "validated" data document that a receiving information system can accurately interpret and import into its particular structures and applications. XML transactions take place on exports from information systems. Likewise, they take place on the import of data into information systems. But at least they are conducting transactions on a commonly defined and understood XML Schema Definition. XML Resources (FAQs, White Papers, Articles, Presentations) as prepared by Data Conversion Laboratory, Inc.